Inventory We are a resale marketplace, not a box office or venue. Ticket prices may exceed face value. This site is not owned by Coral Sky Amphitheatre . The Coral Sky Amphitheatre, formerly The Perfect Vodka, Cruzan, and Sound Advice Amphitheatre, is a 19,000-seat open-air music venue in West Palm Beach, Florida. 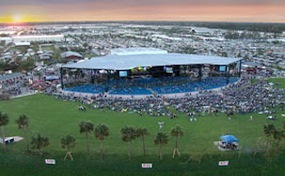 The facility, owned by the South Florida Fairgrounds, is a modern amphitheatre used primarily for concerts and other performances. The backstage area is sometimes used for concerts that are general admission standing room only (mostly heavy metal concerts), while the amphitheater is used as the backstage area. The Coral Sky Amphitheatre brings all the hottest traveling summer shows to the Fort Lauderdale, West Palm Beach, and Miami area. Coral Sky Amphitheater tickets have included Coldplay, Pearl Jam, Zac Brown Band, Jason Aldean, Luke Bryan, Jimmy Buffett, and many more. The Coral Sky Amphitheatre provides a great yaer round outdoor venue for West Palm Beach. CoralSky.AmphitheatreWestPalmBeach.com is not affiliated with any primary box office or supplier. We are a privately owned and operated business specializing in sales in the secondary market. To buy tickets for any Coral Sky Amphitheatre events in West Palm Beach simply click on the event of interest or call our operators at anytime.